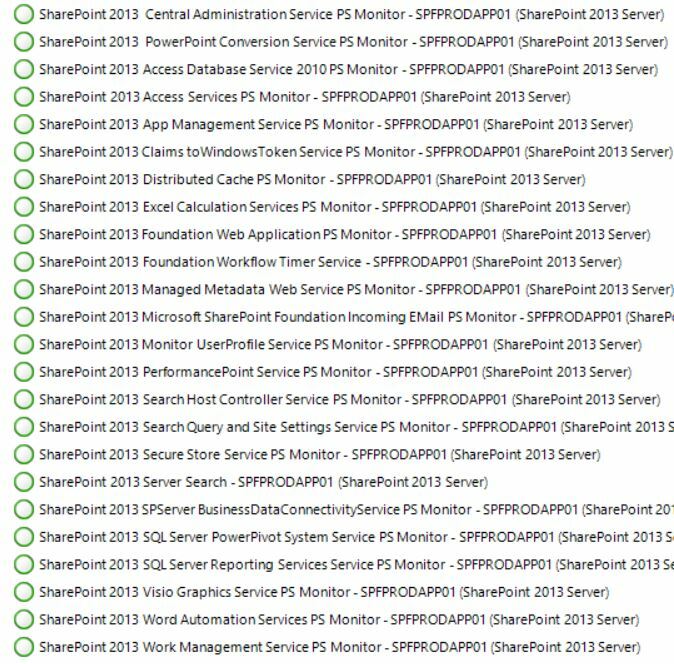 I had a question recently on whether or not the SharePoint 2013 Management Pack monitors when Services are stopped? So this is normally the point that I would put up my feet and bask in the glory of the product team. The SharePoint Services that can only be accessed via the Central Administrative interface are all enumerated above and they are healthy. Question answered, all is well, and there was much rejoicing throughout the land. Unfortunately, I am prone to a nasty habit of testing things. So before breaking into celebratory dance I took one of these services and stopped it waiting impatiently for the inevitable alert to roll in. I waited for a long time. I refreshed many times. No alert came. I was sad. I also noticed that the state view for the relevant service now showed “Not Monitored” whereas before I stopped the service it showed healthy. 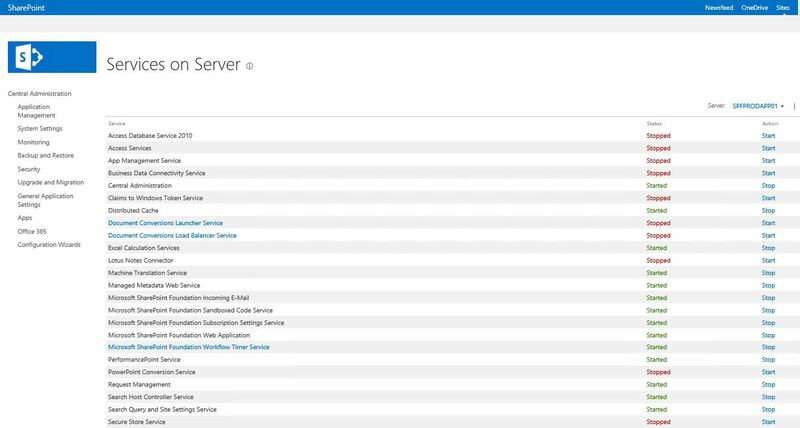 So what you find if you open the Health Explorer for any of these SharePoint specific services is that while there are monitors associated, it’s just that they don’t actually monitor the status of the service. So if it is stopped you lose monitoring around that service and you will never know it unless you go to the view and note the Not Monitored. Part of me really wants to know why this is the case. My completely uninformed guess would be that since SharePoint services can exist on multiple members of the Farm and by design you may only want them running on certain members it is hard to code a solution that isn’t going to be extremely noisy when looking at service status since you as the MP author have no idea that the service being stopped on one server is a critical situation whereas on an identical server it could be by design and non-actionable. 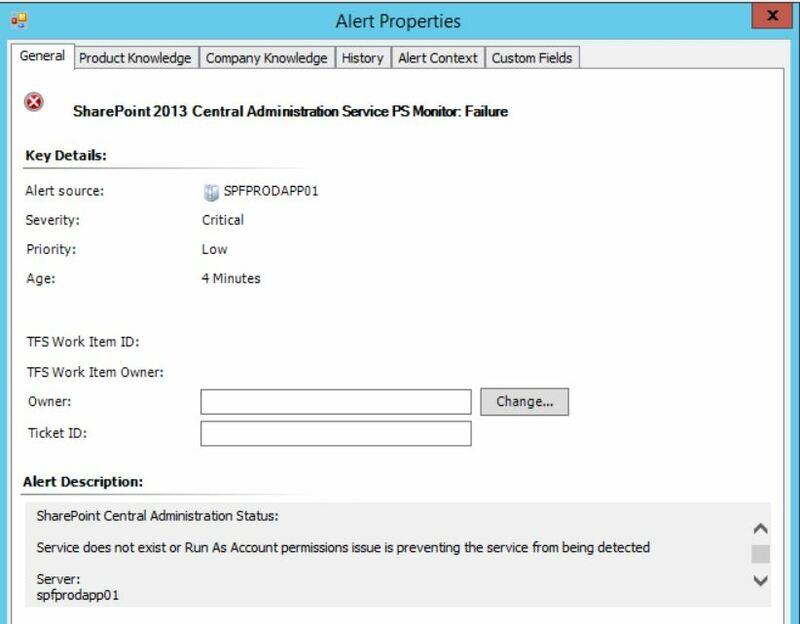 So how do we fix this so that you can selectively monitor service status for certain SharePoint servers and get alerts? 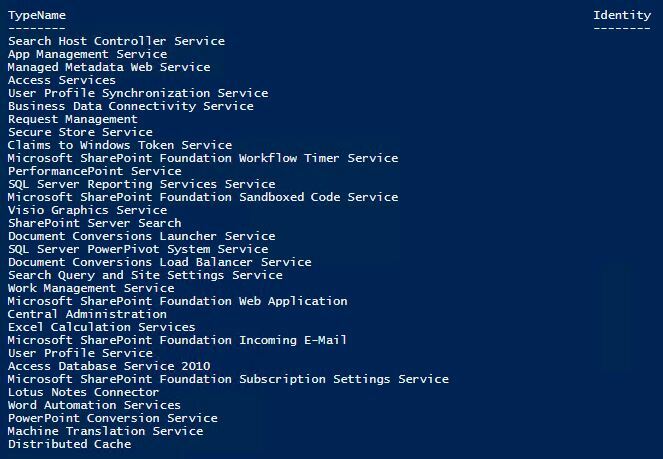 First we have to know a little bit about how SharePoint Services work– which at the time I didn’t know much. I started by stopping services via the Central Administrative site and then trawling all relevant event logs on the SharePoint servers hoping for a nice event ID that I could use. I will hopefully save you some time by telling you that there is no such event ID. There are some events that get generated that are related and will say hopeful things like X Service is Stopping or Starting, but you will find these won’t actually correlate with the time you stopped the service. So this left me with PowerShell. The reason this is important is that if you create a custom script based PowerShell monitor you need to either account for each of these states in your script or alternatively you could get around this with something like any state other than Online would be considered Unhealthy. From here I had enough info to start writing a custom management pack. My original script treated ‘Provisioning’ and ‘Online’ as Healthy and ‘Unprovisioning’ and ‘Disabled’ as Unhealthy. This was then changed in a later revision so that only Online would be considered healthy since you could theoretically have a situation where a service is stuck in a provisioning state for a protracted period of time. I then explicitly gave ‘Provisioning’, ‘Unprovisioning’, and ‘Disabled’ a Status of Unhealthy, this allowed me add one additional status whereby if the script returns anything other than an expected state it will flip to a warning state indicating that either the Run As account is not properly configured or the service isn’t actually present on the server you are targeting. I will skip over the details of how I converted this into a functional management pack, but the end result is an extended MP. By default all monitors are disabled and targeted against the SharePoint 2013 Server Class. 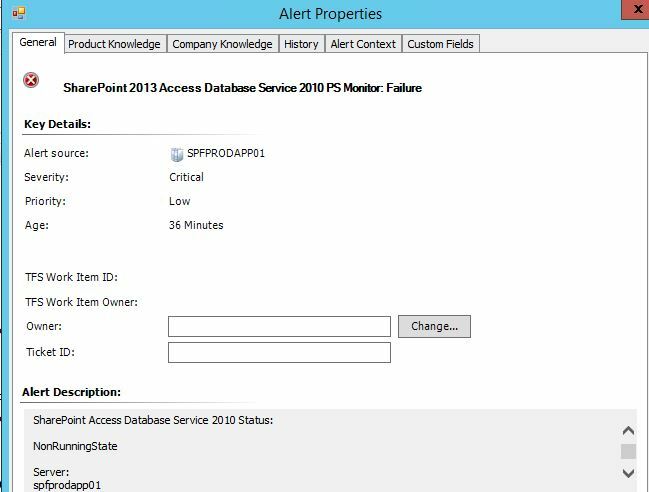 You will need to override and enable on a case by case basis as it is likely that your SharePoint team will only care about monitoring certain services on certain members of the Farm. 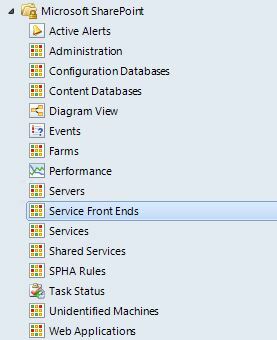 Just add/associate your Run As account that has SharePoint Farm Admin privileges and you should be all set. I tweaked the associated Alert Status for the Run As Warning to critical just so it won’t get missed. As with all MP’s of this nature this is a proof of concept “As-Is” pack. Script based monitoring (Particularly PowerShell based monitoring) can be some of the most intensive monitoring you can perform on a system in terms of overhead so you should test thoroughly first and insure that the extra scripts running is not negatively impacting performance. Currently the pack does not implement cookdown. Normally you would want to limit impact by having a module that runs a single script that queries the status of all relevant services at once and then is referenced by multiple monitors. Currently there is a 1:1 relationship for each monitor, so there is a separate script for each monitor and thus a higher impact on the system. If time allows I will rewrite to properly implement cookdown but in the meantime feel free to take apart the MP and build something better/more efficient, but this should at least help get you started.